Delftia spp. are rod-shaped, gram-negative water and soil bacteria that are resistant to many commonly used antibiotics. Clinical case reports have described infections of Delftia spp. in patients with intravenous catheters, prompting us to investigate the immune response to Delftia spp. stimulation. We hypothesized that stimulation of THP-1 monocytes with Delftia spp. would elicit a pro-inflammatory response. THP-1 cells were stimulated for 24hr with two strains of heat-killed Delftia spp. : Delftia acidovorans ATCC 13751 at a multiplicity of infection (MOI) of 0.6 and 6.0, and Delftia sp. Cs1-4 MOI of 0.8 and 8.0. Purified lipopolysaccharide (LPS) was used as the positive control. Stimulation of monocytes with Delftia spp. resulted in increased monocyte mortality. Further, Western blot analysis revealed increased protein expression of myristoylated alanine-rich c-kinase substrate (MARCKS) and cyclooxygenase-2 (COX-2) in Delftia spp. stimulated monocytes. Tumor necrosis factor (TNF) was also elevated by Delftia spp. stimulation, as measured by enzyme-linked immunosorbent assay (ELISA). All of these proteins are known to contribute to the pro-inflammatory response produced by bacteria, and our data supports our hypothesis that Delftia spp. elicits a pro-inflammatory response in monocytes. The results of this preliminary study are the first to demonstrate that Delftia spp., which have been linked to cases of bacteremia, elicit a pro-inflammatory response in monocytes. Humans encounter a variety of microorganisms every day, many of which generally do not cause disease (Belkaid & Segre, 2014; Macpherson & Harris, 2004; Zanetti, de Luca, Leoni, & Sacchetti, 2014). Delftia spp. is one such genus of microorganisms identified in human samples (DiGiulio et al., 2008; Hagiya et al., 2013; Kawamura et al., 2011; Khan, Sistla, Dhodapkar, & Parija, 2012; Peraneva et al., 2013; Preiswerk, Ullrich, Speich, Bloemberg, & Hombach, 2011). Delftia spp. are rod-shaped, gram-negative, aerobic, flagellated bacteria that have been isolated from Tibetan glaciers (Zhang, Yang, Wang, & Hou,, 2010) as well as public and private water filtration devices in Italy (Zanetti et al., 2014). Delftia spp. are also noted for involvement in the formation of gold nuggets, for the capacity to produce antifungal nanoparticles, and for their identification in the water system of the International Space Station (Johnston et al., 2013; Kumar & Poornachandra, 2015; La Duc, Sumner, Pierson, Venkat, & Venkateswaran, 2004). Recent case reports indicate that Delftia spp. are resistant to antibiotics from multiple classes, including aminoglycosides (Hagiya et al., 2013; Khan et al., 2012). Because Delftia spp. are generally considered non-pathogenic and are resistant to commonly used antibiotics, patients frequently suffer delays in effective treatment due to the time required to identify Delftia spp. infection and assess antibiotic susceptibility. An example of this is when a 46-year-old patient developed D. acidovorans-associated bacteremia as the result of organophosphorus poisoning (Hagiya et al., 2013). This patient was administered ineffective antibiotics for eight days prior to identification of D. acidovorans (Hagiya et al., 2013). Many clinical case reports link Delftia spp. infection with intravenous or indwelling catheters. For example, D. acidovorans-associated bacteremia was found in a healthy four-year-old female with an intercostal drainage tube (Khan et al., 2012). In a different case, an eleven-year-old immunocompromised female suffered recurring D. acidovorans-mediated bacteremia as a result of a contaminated indwelling catheter (Kawamura et al., 2011). Despite increasing reports of infection by Delftia spp., the pro-inflammatory response elicited by this bacterium has not been determined in previous studies. Given that isolates of this bacterium are resistant to many commonly used antibiotics, understanding the immune response is essential to identifying novel anti-inflammatory targets to prevent the development of sepsis in patients infected with Delftia spp. During sepsis, bacterial antigens, such as lipopolysaccharide (LPS) and flagellin, initiate a robust and dysregulated systemic inflammatory response by activating innate immune receptors, such as toll-like receptors (TLRs) (Opal et al., 1999; Ramos, Rumbo, & Sirard, 2004). Herein we investigate the pro-inflammatory immune response to Delftia spp. infection by stimulating THP-1 cells with two heat-killed species: D. acidovorans ATCC 13751 and Delftia sp. Cs1-4. THP-1 cells, a human monocytic cell line, robustly respond to bacterial antigens, such as LPS, which is a component of gram-negative cell walls. THP-1 monocytes are a good model for studying sepsis, given that monocytes are blood mononuclear cells that readily become activated upon stimulation with bacterial antigens. In this novel study, we stimulate monocytes with Delftia spp. strains at different multiplicities of infection (MOI), or the amount of bacteria relative to the amount of monocytes in each sample, to study the affect that the dose of bacteria may play on initiation of the pro-inflammatory response. We evaluate THP-1 mortality via a trypan blue and automatic cell counting approach using a cellometer. We also evaluate the expression of three molecules involved in the pro-inflammatory immune response: cyclooxygenase-2 (COX-2), tumor necrosis factor (TNF), and myristoylated alanine-rich c-kinase substrate (MARCKS). The expression of these mediators was determined by Western blot and enzyme-linked immunosorbent assay (ELISA). COX-2 is a pro-inflammatory enzyme involved in the production of prostaglandin E2, which acts as a vasodilator and activates immune cells (van Ryn, Trummlitz, & Pairet, 2000). TNF is an acute phase, pro-inflammatory cytokine that also serves as a vasodilator and promotes the inflammatory response (Bradley, 2008). While COX-2 and TNF are necessary for normal inflammatory responses, during sepsis the expression of these mediators becomes dysregulated, resulting in septic shock, organ failure, and if not properly treated, death. MARCKS is an actin-binding protein that is upregulated by LPS stimulation and has been shown to negatively regulate LPS-mediated signaling (Mancek-Keber et al., 2012; Rose, Byers, Morash, Fedoroff, & Cook, 1996; Sunohara, Ridgway, Cook, & Byers, 2001). MARCKS also regulates the migration of immune cells toward sites of inflammation as well as the production of cytokines and inflammatory mediators (Eckert, Neuder, Park, Adler, & Jones, 2010; Green et al., 2012; Li et al., 2013; Mancek-Keber et al., 2012). Our overall hypothesis for this study was that stimulation of monocytes with Delftia spp. would result in an increased pro-inflammatory response, as measured by elevated COX-2, MARCKS, and TNF protein expression. Our data presented herein supports this hypothesis and demonstrates that stimulation of monocytes with Delftia spp. results in increased mortality and expression of pro-inflammatory mediators that are associated with sepsis. The results of this study will raise awareness within the medical and public health communities about the Delftia genus and its modulation of the pro-inflammatory response. Preparation of heat-killed Delftia spp. Delftia strain Cs1-4 was obtained from the laboratory of Dr. William Hickey at the University of Wisconsin-Madison. Delftia acidovorans strain ATCC 13751 was obtained from the American Type Culture Collection (ATCC, Manassas, VA). These cultures were plated and grown in order to prepare sufficient amount of bacteria for the stimulation experiments. Delftia cultures were propagated from -80°C freezer stocks by plating on duplicate Tryptic Soy Agar (TSA) plates. TSA plates were incubated for 72hr at room temperature. Tryptic Soy Broth (TSB) cultures (2.5mL) were inoculated in duplicate with isolated colonies of each strain and incubated overnight in a shaking incubator at 30°C and 200rpm. So that an equivalent amount of bacteria was used in each experiment, the cultures were each normalized to an OD600 absorbance value of 1.0 in phosphate-buffered saline (PBS). One hundred microliters of each culture was set aside for determination of colony forming units (CFU)/mL per OD600 unit. The remainder of each normalized culture was incubated at 60°C for 1hr in order to kill the bacteria. An aliquot of the heat-killed cultures was plated in duplicate on TSA plates and incubated for 3d at 30°C to test cell viability after heat exposure. The remainder of the heat-killed cultures were stored at -80°C until use. THP-1 cells (TIB-202, ATCC) were maintained in RPMI 1640 medium (Gibco, Grand Island, NY) with 10% heat-inactivated fetal bovine serum, penicillin (100U/mL), streptomycin (100μg/mL), amphotericin B (250ng/mL), and β-mercaptoethanol (0.1%). This medium provided optimum growth conditions with antibiotics to prevent any bacterial growth. Viable cells were counted by trypan blue exclusion using a Nexcelom Bioscience Auto T4 Cellometer (Lawrence, MA) so that equivalent numbers of viable monocytes were used in each stimulation. 1x106 viable cells were added to six wells of a 24-well plate. One mL of sterile PBS was added to the empty wells. Each well was stimulated as follows: (1) PBS, (2) 100ng/mL LPS (Sigma-Aldrich, St. Louis, MO), (3) Delftia acidovorans ATCC 13751 at a multiplicity of infection (MOI) of 0.6, (4) D. acidovorans ATCC 13751 MOI of 6.0, (5) Delftia sp. Cs1-4 MOI of 0.8, and (6) Delftia sp. Cs1-4 MOI of 8.0. The plate was incubated for 24hr at 37°C with 5% CO2. Samples were harvested (with aliquots reserved for mortality assays) and centrifuged at 3,000rpm for 5min at 4°C. The supernatant was removed and stored at -80°C for the enzyme-linked immunosorbent assay (ELISA). The remaining cell pellets were lysed in order to later measure the protein contained within. They cell pellets were resuspended in 100μL ice-cold (RIPA) buffer (1% NP-40, 0.5% sodium deoxycholate, 0.1% SDS, 150mM NaCl, 50mM Tris-HCl) to denature the cell membranes and was supplemented with a Roche complete mini protease inhibitor cocktail tablet (Indianapolis, IN). One tablet was added to 10mL of RIPA buffer. Each sample was sonicated three times for 15sec with ice incubation between sonication steps. Lysates were clarified by centrifugation at 13000rpm for 10min. To ensure that the same amount of protein from each sample was used in the sodium dodecyl sulfate polyacrylamide gel electrophoresis (SDS-PAGE), protein concentrations of the different samples were calculated two different ways. Protein concentrations of the samples from the first three experiments were determined using the DC protein assay (Bio-Rad, Hercules, CA). The working reagent was prepared using a 50:1 ratio of Reagent A to Reagent S. In each well of a non-treated 96-well plate, 5μL of sample was mixed with 25μL of working reagent, and 200μL of Reagent B was added. The plate was incubated at room temperature for 15min and absorbance was measured at 750nm on a BioTek Synergy HT plate reader (Winooski, VT). The fourth experiment used a PierceTM BCA Protein Assay Kit (Rockford, IL). A working reagent was prepared by mixing 50:1 ratio of Reagent A to Reagent B. This working reagent was added to each sample at a ratio of 20:1 working reagent to sample in a non-treated 96-well plate. The plate was incubated at 37°C for 30min and absorbance was measured at 562nm on a plate reader. SDS-PAGE was used to separate all proteins in the lysate isolated from the cells. Lysates were resuspended in 5X Laemmli sample buffer and boiled for 5min at 95°C prior to loading equal protein levels onto an SDS-PAGE gel (10% NuSep nUView precast gels, New South Wales, Australia). Each sample was loaded onto two separate SDS-PAGE gels along with a Precision Plus Kaleidoscope molecular weight marker (Bio-Rad) and gels were run at 60mA in Tris-Glycine-SDS running buffer. Total protein was transferred to a nitrocellulose membrane using an iBlot semi-dry transfer system (Invitrogen, Carlsbad, CA) so that the proteins became fixed on the membrane to allow for antibody-mediated probing of specific proteins. The gel was placed on a nitrocellulose membrane between the anode and cathode stacks and incubated in the iBlot for 7min on the pre-set Program 3 (P3) to complete the transfer. Both membranes were cut at 50kDa in order to probe for cyclooxygenase-2 (COX-2; 70kDa) and myristoylated alanine-rich c-kinase substrate (MARCKS; 75kDa) at the same time as the glyceraldehyde 3-phosphate dehydrogenase (GAPDH; 35kDa) loading control. The membranes were first blocked to prevent non-specific binding of the antibodies to the membrane. Membranes were blocked in 5% non-fat dry milk (NFDM; suspended in PBS containing 0.05% Tween (PBS/T)) for 1hr at room temperature, shaking. The membranes were then incubated in primary antibodies specific to the proteins being probed. The COX-2 (D5H5) and MARCKS (D88D11) antibodies (1:1000 dilutions) were purchased from Cell Signaling Technology (Beverly, MA); the GAPDH antibody (1:5000 dilution) was purchased from Sigma (clone GAPDH-71.1). Antibody dilutions were prepared in 5% bovine serum albumin (BSA) in PBS/T with 0.2% sodium azide and incubated overnight at 4°C while shaking. Membranes were washed in PBS/T five times for 5min each. Next the membranes were incubated in secondary antibodies, which served two purposes: (1) binding of the protein-specific primary antibody and (2) detection of the protein of interest through an enzyme-substrate reaction. . The GAPDH blots were incubated in goat anti-mouse horseradish peroxidase (HRP, enzyme); E3113; Santa Cruz Biotechnology, Dallas, TX) at a 1:5000 dilution. The COX-2 blot was incubated in anti-rabbit HRP (7074S, Cell Signaling Technology) at a 1:3000 dilution for the first experiment and a 1:4000 for the last three. The MARCKS blot was incubated in anti-rabbit HRP (7074S, Cell Signaling Technology) at a 1:3000 dilution. Secondary antibody dilutions were made in 5% BSA in TBS/T and incubated at room temperature shaking; GAPDH incubated for 1hr while COX-2 and MARCKS incubated for 2hr. Membranes were washed as described above and exposed to the Thermo Scientific Pierce enhanced chemiluminescence (ECL) Western Blotting Substrate for 1min. This substrate reacted to the HRP conjugated to the secondary antibodies, allowing for visualization of the proteins of interest. Membranes were separately imaged in the Bio-Rad Molecular Imager ChemiDoc XRS+ Imaging System using Image Lab software (Version 4.1; Bio-Rad, 2012). A 600-second exposure was used with images taken every 10sec. The blots were analyzed using densitometry, which is a measurement of the intensity of the substrate signal of a sample. Densitometry of the membranes was performed using Image Lab software (Version 4.1; Bio-Rad, 2012). Density values of each band were recorded and analyzed in Microsoft Excel. The COX-2 and MARCKS bands were normalized to their corresponding GAPDH bands and fold-change relative to the PBS sample was calculated. Cell viability was performed using trypan blue exclusion on an automated cellometer with the aliquots saved during the lysate preparation. Percent mortality was calculated by dividing the number of dead cells (trypan blue positive) by the total number of cells counted and multiplying by 100. Production of tumor necrosis factor (TNF) was determined using the eBioscience human TNF alpha ELISA Ready-SET-Go! Kit (San Diego, CA). In this assay, a specific protein (i.e., TNF) binds to a series of antibodies in a 96-well plate, with an enzyme-substrate reaction-mediated color change as the readout for protein presence that is measured by a plate reader. The greater the color change of the enzyme-substrate reaction, the greater amount of the specific protein present. All solutions used were diluted as specified on the certificate of analysis and the provided experimental procedure was followed. The plate was incubated with the capture antibody overnight at 4°C and blocked for 1hr at room temperature before the samples (diluted 1:10) and standard were added to the plate in duplicate. The standards were prepared by serial dilutions of a 500pg/mL stock, resulting in the following standard curve points (pg/mL): 500, 250, 125, 62.5, 31.25, 15.625, 7.8125, 0. The standard curve of known concentrations was used to calculate unknown protein concentrations in the sample. The plate was incubated for 2hr and washed five times in the provided wash buffer before the 1hr detection antibody incubation. The plate was again washed five times before incubation with Avidin-HRP for 30min. The plate was washed five times again and substrate solution was added and incubated for 10min before the stop solution of 1M H3PO4 was applied to halt the reaction so that the samples could be analyzed by the plate reader. The plate was read at 450nm on a BioTek Synergy HT plate reader. The equation of the standard curve was used to calculate protein concentration in pg/mL from the absorbance readings. Figure 1. Stimulation of THP-1 monocytes with Delftia sp. Cs1-4 (MOI of 8.0) resulted in significantly increased mortality. Percent mortality was determined by automated trypan blue exclusion. Significance (p < .05) relative to the PBS group is denoted by an asterisk (*). Data is representative of four independent experiments. Figure 2. THP-1 monocytes treated with the higher MOI of D. acidovorans ATCC 13751 and Delftia sp. Cs1-4 resulted in increased COX-2 protein expression. A: Representative Western blot of COX-2 and GAPDH loading control. B: Protein densitometry of COX-2 normalized to GAPDH with fold-change relative to PBS treatment group. Significance (p < .05) relative to the PBS group is denoted by an asterisk (*). The pound sign (#) indicates a nearly significant value of p = .050. Data is representative of four independent experiments. Statistical analysis was performed using the GraphPad Prism software package (Version 6; Graph Pad Software, Inc., 2014) and a two-tailed t-test, with a p-value of less than .05 considered significant. A statistically significant increase in mortality was observed in lipopolysaccharide (LPS) and Cs1-4 multiplicity of infection (MOI) of 8.0 treatment groups as compared to phosphate-buffered saline (PBS) when stimulated for 24 hours (Figure 1). The remaining groups (ATCC MOI of 0.6, ATCC MOI of 6.0, Cs1-4 MOI of 0.8) resulted in a modest increase in cell mortality compared to PBS control. The PBS group resulted in about 5% monocyte mortality, which may be attributed to the natural mortality rate of the cells. Stimulation with the higher MOI of Delftia spp. (ATCC MOI of 6.0 and Cs1-4 MOI of 8.0) revealed dramatically increased cyclooxygenase-2 (COX-2) expression as compared to both PBS and LPS stimulated groups, with the Cs1-4 MOI group being statistically increased (p < 0.05) compared to PBS (Figure 2). A modest elevation of COX-2 protein expression compared to the baseline protein expression of the PBS group was observed in the LPS, ATCC MOI of 0.6, and Cs1-4 MOI of 0.8 treatment groups. The LPS stimulated group was not significantly increased. The LPS and all Delftia spp. treatment groups demonstrated increased myristoylated alanine-rich c-kinase substrate (MARCKS) protein expression compared to the baseline protein expression in the PBS control (Figure 3). Statistically increased MARCKS expression was observed in the ATCC MOI of 6.0, Cs1-4 MOI of 0.8, and Cs1-4 MOI of 8.0 groups relative to PBS (Figure 3B). The MARCKS expression in these groups was also increased relative to the LPS positive control. As with the COX-2 data, the LPS group was not statistically significant. A clear difference can be seen between the levels of MARCKS expression in the ATCC stimulated groups, as the ATCC MOI of 6.0 treatment group resulted in increased elevated MARCKS protein compared to the MOI of 0.6 group. Finally, stimulation by both Delftia spp. strains (high and low MOI) and the LPS group significantly increased tumor necrosis factor (TNF) production in THP-1 cells as compared to PBS (Figure 4). Figure 3. MARCKS protein expression was significantly increased in THP-1 monocytes stimulated with both strains of Delftia spp. A: Representative Western blot of MARCKS and GAPDH loading control. B: Protein densitometry of MARCKS normalized to GAPDH with fold-change relative to PBS treatment group. Significance (p < .05) relative to the PBS group is denoted by an asterisk (*). Data is representative of four independent experiments. Figure 4. THP-1 monocytes stimulated with both strains of Delftia spp. had significantly increased TNF protein production. TNF protein production (pg/mL) in culture supernatants was measured by ELISA. Significance (p < .05) relative to the PBS group is denoted by an asterisk (*). Data is representative of four independent experiments. Our experiments focused on the human immune response to Delftia spp. using two commonly-used strains: Delftia sp. Cs1-4 and Delftia acidovorans ATCC 13751. Upon stimulation of monocytes with several different multiplicities of infection (MOI), our results consistently showed an increased inflammatory response with regards to cell mortality, cyclooxygenase-2 (COX-2) and myristoylated alanine-rich c-kinase substrate (MARCKS) protein expression, and tumor necrosis factor (TNF) production. In comparison to the phosphate-buffered saline (PBS) treatment group, a trend for increased cell mortality was observed in all treatment groups, and this included a statistically significant increase in the lipopolysaccharide (LPS) and Cs1-4 MOI of 8.0 groups. It should be noted that a 5% mortality rate was observed in the PBS group, which most likely indicates the baseline mortality rate of the cells. It is also important to note that the bacteria were heat-killed prior to stimulation, which may have resulted in decreased monocyte mortality compared to stimulation with live Delftia spp.. Regardless, the significance of the Cs1-4 MOI of 8.0 treatment group demonstrates that Delftiaspp. negatively affect the viability of immune cells. The response caused by Cs1-4 MOI of 8.0 is significant throughout our experiment, as significantly increased MARCKS and COX-2 expression as well as TNF production were also observed in cells stimulated with this treatment. A dramatic increase in COX-2 protein expression was observed in the higher MOI Delftia spp. treatment groups compared to the PBS control. The ATCC MOI of 6.0 treatment group was nearly significant (p = 0.050) and the Cs1-4 MOI of 8.0 treatment was statistically significant. The tenfold increase in MOI in the ATCC and Cs1-4 strains resulted in about a five-fold increase in COX-2 protein expression compared to the PBS control. It is likely that this induction is dependent on the multiplicity of infection and future experiments should include a dose response with Delftia spp. strains. Low COX-2 protein expression was observed in the LPS, ATCC MOI of 0.6, and Cs1-4 MOI of 0.8 treatment groups, which is contrasted to the significant and nearly significant values of the higher MOI Delftia treatment groups. The lack of significance in the LPS group was unexpected, as LPS is shown to increase COX-2 expression (Barrios-Rodiles, Tiraloche, Chadee, 1999). This could be explained several ways. First, an LPS dose response could be performed to determine the appropriate LPS concentration for use in this study, as the 100ng/mL dose used here did not result in statistically elevated COX-2 expression. Second, other bacterial antigens, such as flagellin, could also be stimulating COX-2 expression and/or play a more pivotal role in Delftia spp. mediated pro-inflammatory responses. Third, we are specifically using THP-1 cells, which may have intrinsically different LPS-mediated COX-2 response profiles not observed in other studies with alternative cell types. Our data suggest that patients who are infected with Delftia spp. in either a local or systemic manner likely have elevated COX-2 protein expression. Given that COX-2 is involved in the genesis of the potent vasodilator prostaglandin E2 (PGE2) (Norberg et al., 2013; Ricciotti & FitzGerald, 2011), we hypothesize that elevated PGE2 is also observed in Delftia spp. infections. Additionally, these data suggest the use of either selective or non-selective COX-2 inhibitors to control inflammation associated with Delftia spp. infection. Examples of selective COX-2 inhibitors include cavidine (Niu, Zhang et al., 2014) and esculentic acid (Niu , Mu et al., 2014), while the non-steroidal anti-inflammatory drug (NSAID) diclofenac is an example of a non-selective COX-2 inhibitor (Kida et al., 2014). Further investigation is needed to confirm that these selective and non-selective inhibitors decrease COX-2 expression and subsequent prostaglandin E2 production upon Delftia spp. stimulation. In our studies, a statistically significant increase in MARCKS protein expression occurred in ATCC MOI of 6.0 and both Cs1-4 groups relative to the PBS treated group. This suggests that different strains of Delftia spp. may differentially regulate gene expression in monocytes, which could be tested through use of a variety of clinical Delftia spp. isolates in future experiments. The comparable response of both Cs1-4 treatments, MOI of 0.8 and MOI of 8.0, suggests that for some strains a lower MOI is sufficient to elevate MARCKS expression. This should be investigated further by performing more comprehensive dose response experiments. To date, LPS is the only toll-like receptor ligand that has been shown to upregulate MARCKS expression. We observed a similar trend in that LPS stimulation of THP-1 monocytes resulted in a non-significant increase in MARCKS protein expression. As mentioned with the COX-2 data, this could be due to an inadequate LPS dosage or the fact that THP-1 cells are being used in this study, which may not elicit as robust of a response as other cell types. This warrants future investigation into the role of LPS in the upregulation of MARCKS in THP-1 monocytes. Regardless, the presence of MARCKS protein in Delftia spp. stimulated cells suggests that Delftia spp. is stimulating an immune response in THP-1 monocytes. The exact role of MARCKS in LPS signaling is not fully understood. Mancek-Keber et al. (2012) have shown that MARCKS-mediated negative regulation of LPS signaling is associated with decreased TNF production. Thus, it is possible that MARCKS may help regulate the pro-inflammatory response by turning off LPS-mediated signaling, with further investigation needed to confirm this hypothesis. TNF production was significantly increased in all treatment groups as compared to PBS. The observed TNF production in the PBS group is likely due to normal low-level production of the cytokine in healthy, untreated cells. The increase in the Delftia spp. stimulation groups was comparable to LPS stimulation, indicating a strong inflammatory response by the monocytes. TNF has been shown to be upregulated by both LPS and flagellin, both of which are expressed by Delftia spp. and signal through toll-like receptor 4 (TLR-4) and toll-like receptor 5 (TLR-5), respectively (Bradley, 2008; Uchida et al., 2014). Investigating the contribution of TLR-4 and TLR-5 on Delftia spp. mediated TNF production could provide insight into the mechanisms by which Delftia spp. interact with immune cells. Further, investigation into whether commonly used anti-inflammatory drugs decrease Delftia spp. stimulated TNF production in monocytes is needed. Examples of anti-inflammatory drugs that have been shown to decrease TNF production include glucocorticoids, such as dexamethasone, and SB203580, a p38 mitogen-activated protein kinase (MAPK) inhibitor (Cuenda et al., 1995; Neuder, Keener, Eckert, Trujillo, & Jones, 2009). The data collected here serve as a starting point for the improved understanding of the immune response in patients infected with Delftia spp. The antibiotic resistance found in Delftia species (Hagiya et al., 2013; Khan et al., 2012) prevents effective treatment, which can lead to the development of sepsis. With greater knowledge of the human immune response to Delftia spp., effective treatments can be administered. Further, prevention of infection is also of critical importance as case studies have regularly found Delftia spp. at sites for intravenous catheters and other indwelling medical devices. Interestingly, we found that Delftia spp. is not easily killed by sonication (data not shown), as thoroughly sonicated bacteria still grew when plated on Tryptic Soy Agar (TSA) media. Heat exposure, however, was sufficient to kill the Delftia spp. strains for use in the experiments presented herein. If DNA of Delftia spp. has been found in sterile DNA extraction kits (Salter et al., 2014), it is also possible that Delftia spp. are present on medical devices before use. Further investigation as to whether Delftia spp. are killed by irradiation, bactericidal UV light, or other sanitizing methods would be useful to help understand how patients are becoming infected with these bacteria. It is also possible that Delftia spp. are members of the human microbiome, as Delftia acidovorans DNA has been found in the blood of healthy patients (Peraneva et al., 2013) as well as in the oral microbiome (Chen et al., 2015). Inadequate sanitation of patients’ skin prior to the use of indwelling catheters could have resulted in infection. This highlights the need for medical staff working with immunocompromised patients to take extra precautions in order to prevent Delftia spp. infections. The data presented herein comprise a pilot study, with further investigation needed to better understand the pro-inflammatory response elicited by Delftia spp. Our study focuses on only two species of Delftia , providing little breadth for the characterization of the pro-inflammatory response to this genus as a whole. Additionally, the species we investigated were environmental, not clinical, isolates. Clinical isolates could elicit immune responses distinct from the environmental isolates used herein. Thus, future research will investigate pro-inflammatory responses to additional species of Delftia , including clinical isolates of Delftia tsuruhatensis (Preiswerk et al., 2011). Our current data are also limited by the use of heat-killed Delftia spp., which were used in this study to decrease the possibility of contaminating our tissue culture facility. In a clinical situation, however, live Delftia spp. would perform biological processes that heat-killed cells do not, such as secreting chemical mediators that may alter the inflammatory response. Furthermore, in vivo bacterial infections involve many cell types in addition to monocytes. Development of an in vivo model for the study of Delftia-induced inflammation would be particularly useful in understanding the effects of a live Delftia spp. infection, the role of multiple cell types in the pro-inflammatory response, and the largely uncharacterized antibiotic susceptibility of Delftia spp. Ultimately, future research will provide data to help inform physicians about appropriate treatment regimens for patients infected with Delftia spp. The authors would like to thank the North Carolina State University (NCSU) Biotechnology Program and the NCSU Office of Undergraduate Research for financial support of this study. The authors would also like to thank Dr. William Hickey at the University of Wisconsin-Madison for kindly providing the Delftia sp. Cs1-4 strain. American Type Culture Collection. Delftia acidovorans strain ATCC 13751. Manassas, VA.
Barrios-Rodiles, M., Tiraloche, G., & Chadee, K. (1999). Lipopolysaccharide modulates cyclooxygenase-2 transcriptionally and posttranscriptionally in human macrophages independently from endogenous IL-1 beta and TNF-alpha. Journal of Immunology , 163(2), 963-969. Belkaid, Y., & Segre, J. A. (2014). Dialogue between skin microbiota and immunity. Science , 346(6212), 954-959. Bio-Rad. DC protein assay. Hercules, CA. Bio-Rad. Molecular Imager ChemiDoc XRS+ Imaging System. Hercules, CA. Bio-Rad. Image Lab 4.1 software. Hercules, CA. Bio-Rad. Precision Plus Kaleidoscope molecular weight marker. Hercules, CA. BioTek. Synergy HT plate reader. Winooski, VT.
Bradley, J. R. (2008). TNF-mediated inflammatory disease. The Journal of Pathology, 214(2), 149-160. Cell Signaling Technology. Cox2 (D5H5) XP Rabbit mAb. Beverly, MA. Cell Signaling Technology. Goat anti-rabbit IgG, HRP-linked antibody #7074S. Beverly, MA. Cell Signaling Technology. MARCKS (D88D11) XP Rabbit mAb. Beverly, MA. Chen, L., Qin, B., Du, M., Zhong, H., Xu, Q., Li, Y., Zhang, P., & Fan, M. (2015). Extensive description and comparison of human supra-gingival microbiome in root caries and health. PloS One, 10(2), e0117064. Cuenda, A., Rouse, J., Doza, Y. N., Meier, R., Cohen, P., Gallagher, T. F., Young, P. R., & Lee, J. C. (1995). SB 203580 is a specific inhibitor of a MAP kinase homologue which is stimulated by cellular stresses and interleukin-1. FEBS Letters, 364(2), 229-233. DiGiulio, D. B., Romero, R., Amogan, H. P., Kusanovic, J. P., Bik, E. M., Gotsch, F., Kim, C. J., Erez, O., Edwin, S., & Relman, D. A. (2008). Microbial prevalence, diversity and abundance in amniotic fluid during preterm labor: A molecular and culture-based investigation. PloS One, 3(8), e3056. eBioscience. Human TNF alpha ELISA Ready-SET-Go! Kit. San Diego, CA. Eckert, R. E., Neuder, L. E., Park, J., Adler, K. B., & Jones, S. L. (2010). Myristoylated alanine-rich C-kinase substrate (MARCKS) protein regulation of human neutrophil migration. American Journal of Respiratory Cell and Molecular Biology, 42(5), 586-594. Gibco, Thermo Fisher Scientific. RPMI 1640 cell culture medium. Grand Island, NY. GraphPad Prism [Computer software]. (2014). Retrieved from http://graphpad.com/scientific-software/prism/. Green, T. D., Park, J., Yin, Q., Fang, S., Crews, A. L., Jones, S. L., & Adler, K. B. (2012). Directed migration of mouse macrophages in vitro involves myristoylated alanine-rich C-kinase substrate (MARCKS) protein. Journal of Leukocyte Biology, 92(3), 633-639. Hagiya, H., Murase, T., Sugiyama, J., Kuroe, Y., Nojima, H., Naito, H., Hagioka, S., & Morimoto, N. (2013). Delftia acidovorans bacteremia caused by bacterial translocation after organophosphorus poisoning in an immunocompetent adult patient. Journal of Infection and Chemotherapy: Official Journal of the Japan Society of Chemotherapy, 19(2), 338-341. Image Lab [Computer software]. (2012). Retrieved from http://www.bio-rad.com/en-us/product/image-lab-software?tab=Description. Invitrogen. iBlot semi-dry gel transfer system. Carlsbad, CA. Johnston, C. W., Wyatt, M. A., Li, X., Ibrahim, A., Shuster, J., Southam, G., & Magarvey, N. A. (2013). Gold biomineralization by a metallophore from a gold-associated microbe. Nature Chemical Biology, 9(4), 241-243. Kawamura, I., Yagi, T., Hatakeyama, K., Ohkura, T., Ohkusu, K., Takahashi, Y., Kojima, S., & Hasegawa, Y. (2011). Recurrent vascular catheter-related bacteremia caused by delftia acidovorans with different antimicrobial susceptibility profiles. Journal of Infection and Chemotherapy : Official Journal of the Japan Society of Chemotherapy, 17(1), 111-113. Khan, S., Sistla, S., Dhodapkar, R., & Parija, S. C. (2012). Fatal delftia acidovorans infection in an immunocompetent patient with empyema. Asian Pacific Journal of Tropical Biomedicine, 2(11), 923-924. Kida, T., Kozai, S., Takahashi, H., Isaka, M., Tokushige, H., & Sakamoto, T. (2014). Pharmacokinetics and efficacy of topically applied nonsteroidal anti-inflammatory drugs in retinochoroidal tissues in rabbits. PloS One, 9(5), e96481. Kumar, C. G., & Poornachandra, Y. (2015). Biodirected synthesis of miconazole-conjugated bacterial silver nanoparticles and their application as antifungal agents and drug delivery vehicles. Colloids and Surfaces.B, Biointerfaces, 125, 110-119. La Duc, M. T., Sumner, R., Pierson, D., Venkat, P., & Venkateswaran, K. (2004). Evidence of pathogenic microbes in the international space station drinking water: Reason for concern? Habitation, 10(1), 39-48. Li, J., D'Annibale-Tolhurst, M. A., Adler, K. B., Fang, S., Yin, Q., Birkenheuer, A. J., Levy, M. G., Jones, S. L., Sung, E. J., Hawkins, E. C., Yoder, J. A., & Nordone, S. K. (2013). A myristoylated alanine-rich C kinase substrate-related peptide suppresses cytokine mRNA and protein expression in LPS-activated canine neutrophils. American Journal of Respiratory Cell and Molecular Biology, 48(3), 314-321. Macpherson, A. J., & Harris, N. L. (2004). Interactions between commensal intestinal bacteria and the immune system. Nature Reviews.Immunology, 4(6), 478-485. Mancek-Keber, M., Bencina, M., Japelj, B., Panter, G., Andra, J., Brandenburg, K., Triantafilou, M., & Jerala, R. (2012). MARCKS as a negative regulator of lipopolysaccharide signaling. Journal of Immunology, 188(8), 3893-3902. Neuder, L. E., Keener, J. M., Eckert, R. E., Trujillo, J. C., & Jones, S. L. (2009). Role of p38 MAPK in LPS induced pro-inflammatory cytokine and chemokine gene expression in equine leukocytes. Veterinary Immunology and Immunopathology, 129(3-4), 192-199. Nexcelom Bioscience. Auto T4 Cellometer. Lawrence, MA. Niu, X., Mu, Q., Li, W., Yao, H., Li, H., & Huang, H. (2014). Esculentic acid, a novel and selective COX-2 inhibitor with anti-inflammatory effect in vivo and in vitro. European Journal of Pharmacology, 740, 532-538. Niu, X., Zhang, H., Li, W., Mu, Q., Yao, H., & Wang, Y. (2014). Anti-inflammatory effects of cavidine in vitro and in vivo, a selective COX-2 inhibitor in LPS-induced peritoneal macrophages of mouse. Inflammation, 38(2), 923-33. Norberg, J. K., Sells, E., Chang, H. H., Alla, S. R., Zhang, S., & Meuillet, E. J. (2013). Targeting inflammation: Multiple innovative ways to reduce prostaglandin E(2). Pharmaceutical Patent Analyst, 2(2), 265-288. NuSep. 10% nUView precast SDS-PAGE gels. New South Wales, Australia. Opal, S. M., Scannon, P. J., Vincent, J. L., White, M., Carroll, S. F., Palardy, J. E., Parejo, N. A., Pribble, J. P., & Lemke, J. H. (1999). Relationship between plasma levels of lipopolysaccharide (LPS) and LPS-binding protein in patients with severe sepsis and septic shock. The Journal of Infectious Diseases, 180(5), 1584-1589. Peraneva, L., Fogarty, C. L., Pussinen, P. J., Forsblom, C., Groop, P. H., & Lehto, M. (2013). Systemic exposure to pseudomonal bacteria: A potential link between type 1 diabetes and chronic inflammation. Acta Diabetologica, 50(3), 351-361.Preiswerk, B., Ullrich, S., Speich, R., Bloemberg, G. V., & Hombach, M. (2011). Human infection with delftia tsuruhatensis isolated from a central venous catheter. Journal of Medical Microbiology, 60(Pt 2), 246-248. Ramos, H. C., Rumbo, M., & Sirard, J. C. (2004). Bacterial flagellins: Mediators of pathogenicity and host immune responses in mucosa. Trends in Microbiology, 12(11), 509-517. Ricciotti, E., & FitzGerald, G. A. (2011). Prostaglandins and inflammation. Arteriosclerosis, Thrombosis, and Vascular Biology, 31(5), 986-1000. Roche. Complete mini protease inhibitor cocktail tablet. Indianapolis, IN. Rose, S. D., Byers, D. M., Morash, S. C., Fedoroff, S., & Cook, H. W. (1996). Lipopolysaccharide stimulates differential expression of myristoylated protein kinase C substrates in murine microglia. Journal of Neuroscience Research, 44(3), 235-242. Salter, S. J., Cox, M. J., Turek, E. M., Calus, S. T., Cookson, W. O., Moffatt, M. F., Turner, P., Parkhill, J., Loman, N. J., & Walker, A. W. (2014). Reagent and laboratory contamination can critically impact sequence-based microbiome analyses. BMC Biology, 12, 87-014-0087-z. Santa Cruz Biotechnology. Goat anti-mouse HRP-linked antibody E3113. Dallas, TX. Sigma-Aldrich. Lipopolysaccharides from Escherichia coli. St. Louis, MO. Sigma-Aldrich. Monoclonal Anti-GAPDH, Clone GAPDH-71.1. St. Louis, MO. Sunohara, J. R., Ridgway, N. D., Cook, H. W., & Byers, D. M. (2001). Regulation of MARCKS and MARCKS-related protein expression in BV-2 microglial cells in response to lipopolysaccharide. Journal of Neurochemistry, 78(3), 664-672. Thermo Scientific Pierce. Bicinchoninic Protein Assay Kit. Rockford, IL. Thermo Scientific Pierce. Enhanced chemiluminescence Western Blotting Substrate. Rockford, IL. Uchida, M., Oyanagi, E., Kawanishi, N., Iemitsu, M., Miyachi, M., Kremenik, M. J., Onodera, S., & Yano, H. (2014). Exhaustive exercise increases the TNF-alpha production in response to flagellin via the upregulation of toll-like receptor 5 in the large intestine in mice. Immunology Letters, 158(1-2), 151-158.
van Ryn, J., Trummlitz, G., & Pairet, M. (2000). 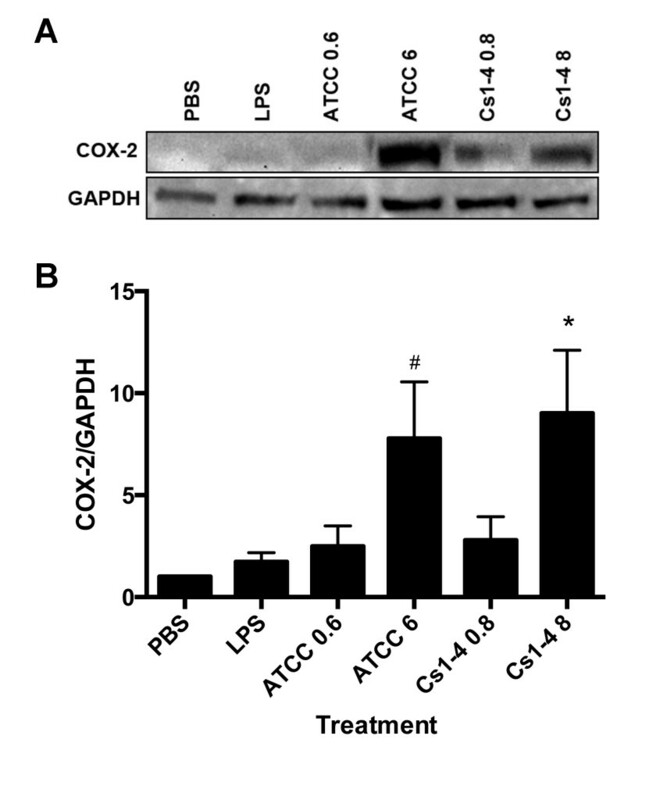 COX-2 selectivity and inflammatory processes. Current Medicinal Chemistry, 7(11), 1145-1161. Zanetti, F., de Luca, G., Leoni, E., & Sacchetti, R. (2014). Occurrence of non-fermenting gram negative bacteria in drinking water dispensed from point-of-use microfiltration devices. Annals of Agricultural and Environmental Medicine : AAEM, 21(1), 29-34. Zhang, S., Yang, G., Wang, Y., & Hou, S. (2010). Abundance and community of snow bacteria from three glaciers in the Tibetan Plateau. Journal of Environmental Sciences (China), 22(9), 1418-1424.